The research comes at a time when greater attention is being paid to assessing and preventing the head injuries sustained by both soldiers and athletes. Some kinds of head injuries are difficult to see with standard diagnostic imaging but can have serious long-term consequences. Concussions, once dismissed as a short-term nuisance, have more recently been linked to serious brain disorders. To help doctors answer this question, Ramesh led a team that used a powerful technique called diffusion tensor imaging, together with a computer model of the head, to identify injured axons, which are tiny but important fibers that carry information from one brain cell to another. These axons are concentrated in a kind of brain tissue known as “white matter,” and they appear to be injured during the so-called mild traumatic brain injury associated with concussions. Ramesh’s team has shown that the axons are injured most easily by strong rotations of the head, and the researchers’ process can calculate which parts of the brain are most likely to be injured during a specific event. The team described its new technique in the Jan. 8 edition of the Journal of Neurotrauma. The lead author, Rika M. Wright, played a major role in the research while completing her doctoral studies in Johns Hopkins’ Whiting School of Engineering, supervised by Ramesh. Wright is now a postdoctoral research fellow at Carnegie Mellon University. Ramesh is continuing to conduct research using the technique at Johns Hopkins with support from the National Institutes of Health. Armed with this knowledge, Ramesh and his colleagues want to use their new technology to examine athletes, particularly football and hockey players, who are tackled or struck during games in ways that inflict that violent side-to-side motion on the head. In the recent journal article, the authors point out that many professional sports games are recorded in high-definition video from multiple angles. This, they write, could allow researchers to reconstruct the motions involved in sport collisions that lead to the most serious head injuries. The authors also noted that some sports teams equip their players’ helmets or mouth guards with instruments that can measure the acceleration of the head during an impact. Such data, entered into the researchers’ computer model, could help determine the likely location of brain damage. These results, combined with neuropsychological tests, could be used to guide the athlete’s treatment and rehabilitation, the authors said, and to help a sports team decide when an athlete should be allowed to resume playing. This strategy also may help reduce the risk to athletes arising from a degenerative disease linked to repeated concussions. More research, testing and validation must be conducted before the computer model can become useful in a clinical setting. This will include animal experiments and the correlation of data from event reconstruction to make sure the model accurately identifies brain injuries. In addition to Wright and Ramesh, the co-authors of the study were Andrew Post and Blaine Hoshizaki, both of the Neurotrauma Impact Science Library, Department of Human Kinetics, University of Ottawa, Canada. Funding for the research was provided by a National Science Foundation Graduate Research Fellowship and by the Whiting School-based Center for Advanced Metallic and Ceramic Systems. 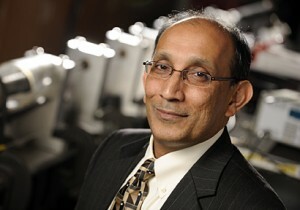 Ramesh is founding director of the Hopkins Extreme Materials Institute, of which the center is a part. Ramesh and Jerry L. Prince, the William B. Kouwenhoven Professor of Electrical and Computer Engineering at Johns Hopkins, also are part of a team that recently received a five-year, $2.25 million National Institutes of Health grant to better understand traumatic brain injuries in order to improve methods for prevention and treatment. The principal investigator on the NIH project is Philip Bayly, the Lilyan and E. Lisle Hughes Professor of Mechanical Engineering at Washington University in St. Louis.